While Matt was up perusing Dawson City on the Top of the World highway, Henning and I continued along the Alaskan Highway where we met a number of interesting characters along the way, one of whom being is Dorothy Cook. 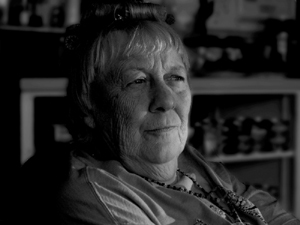 Dorothy moved to Koidern River in 1969 from Winnipeg to follow her husbands dreams. When they moved to this isolated outpost they had to build everything they needed. They also had to bring a generator to power the house (which they still do) as well as having to drill 93 feet through the permafrost to get to water. They own a nice little gas station which is a real treat to enter. Cut gems and polished rocks greet the visitor and entice them to forage through the untold amount of nic nacs available. In another corner of the store are half opened boxes of stones and crystals waiting for a visit to the rock saw. We sat and chatted with Dorothy for over an hour drinking coffee and eating some of the best homemade cake while being drawn into her conversation on times that were and times that are. These days Dorothy and her husband escape to Arizona or Mexico for their Winters as she really does not like the cold.